Raphael means "God heals" in Hebrew, and St. Raphael is known as the Archangel of healing, generally associated with the angel mentioned in the Gospel of John as stirring the water at the healing pool of Bethesda. 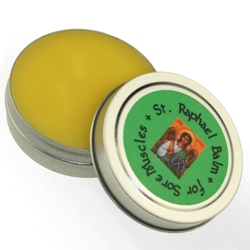 Made by the sisters of Transfiguration Monastery with pure beeswax, olive oil, avocado oil, vitamin E and essential oils of lavender, eucalyptus, ginger root, rose hip, calendula and arnica, this fragrant balm will soothe sore muscles. 1-oz. tin. Transfiguration Monastery is a small, contemplative Benedictine monastery located in Windsor, NY, in the Diocese of Syracuse. Founded in 1979 by three Sisters, they became formally affiliated with the Camaldolese Benedictine Congregation in 1986. The Camaldolese charism provides for seeking God in both community and solitude, while allowing more outreach and a less restricted enclosure than is usually possible for contemplative nuns. For practical reasons, they have begun the process of changing their affiliation to an English-speaking Benedictine congregation, but they continue to draw inspiration from the Camaldolese ideal. Their small number permits flexibility, creativity, abundant use of individual gifts and the opportunity to build a monastic foundation. Mar 9, 2017 | By Jacalyn L.
I bought the balm for myself. I loved the scent; not overbearing. It goes on nicely and I did feel warmth and healing! I love this balm. After years of neck and back problems (not to mention surgeries) I am always on the look out for items that will help with pain (non prescriptions). This balm is a little hard to get out of the container but is well worth the effort. It goes on clean, the scent is comforting and I say a prayer to St. Raphael to help soothe the pain away if even for a temporary fix. An act of doing good for the body and the soul.